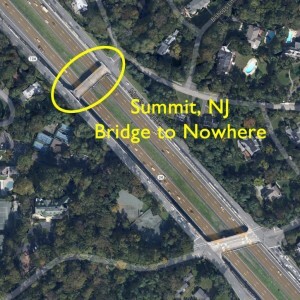 I was reading up on bridges to nowhere and came across a reference to one in Summit, NJ. I did some hunting on a few maps and found it. It crosses over Highway 24 at 40.7290705°N, -74.3473538°W. Brantwood looks like it goes into an affluent area, the residents probably asked that the overpass be closed. The road dead ends on the Southwest side of the highway. The main reason to use the overpass was for east bound traffic to cross into the Brantwood neighborhood or to switch to the westbound 124. 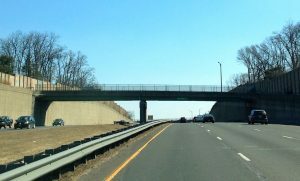 The next overpass is not to far east and has connecting roads on either side of the highway. You can see it on Google Maps.